Well, this is seriously awesome! For anyone who has ever taken a CPR class, you know that the training can feel more than a little basic. That may not be the case for much longer, though, because this incredible new CPR dummy is revolutionizing medical education with a totally new and groundbreaking feature: It comes with a second dummy that audibly mourns its dead son. Yes! Just yes! This is seriously going to change the way we train our first responders! Designed to look and feel more realistic than ever before, this cutting-edge CPR dummy comes with a companion dummy that is programmed to loudly fear for her son’s well-being. 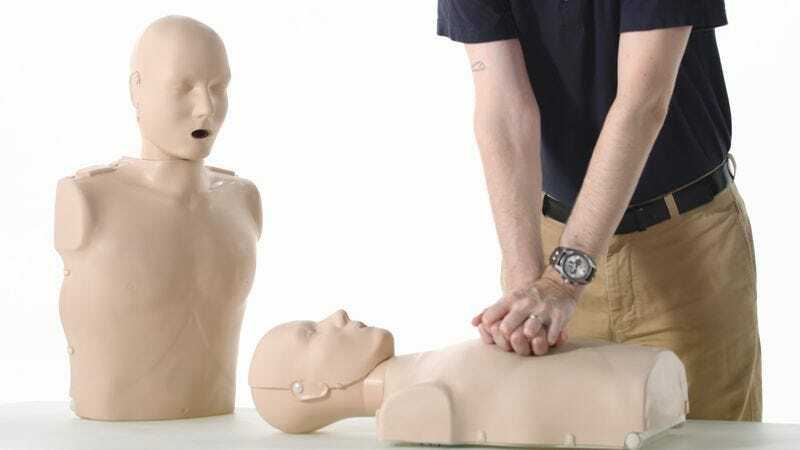 To simulate the presence of a terrified mother, students simply need to practice resuscitating the dummy while a second, larger dummy faces them and moans in anguish. The innovative addition is able to mimic a wide range of actions, from begging medics to save her son to berating herself for letting this happen, and it comes fully loaded with 18 distinct types of wailing. Simply put, this will give anyone looking to receive their CPR certification the most realistic training experience to date! Just check out this demo of this amazing product at work! Whoa! This is some seriously next-level stuff. While nothing can truly prepare you for the awful moment when you administer CPR for the first time, this mournful, highly distraught dummy might be the closest thing. Not only is the dummy programmed to scream for the duration of any simulation, but if need be, it can continue to wail for up to two hours after the procedure has been completed. To some, this advancement in medical education might seem small, but for many, this mournful dummy will go a long way. We can only hope that more stuff like this keeps getting invented and continues to save lives!